Why Has My Water Turned Brown? Most of turn on our fixtures and expect crystal clear water, so it can come as an unpleasant surprise when the water flowing out of your our taps is discolored. When you notice that your water has turned brown, you’ll need to avoid using it and check with your local water utility company to see if there is any information about infrastructure problems. This could be an issue with the city pipes or distribution lines that has impacted the quality of your water supply. If there are no issues or notices from your local water provider, you’ll need to troubleshoot your home’s piping. There are a number of reasons why your water may appear discolored or brown. It can occur spontaneously as a result of a burst water main, or it could develop over time due to rusty pipework, sediment build up inside your hot water heater, or too much manganese or iron in your water. 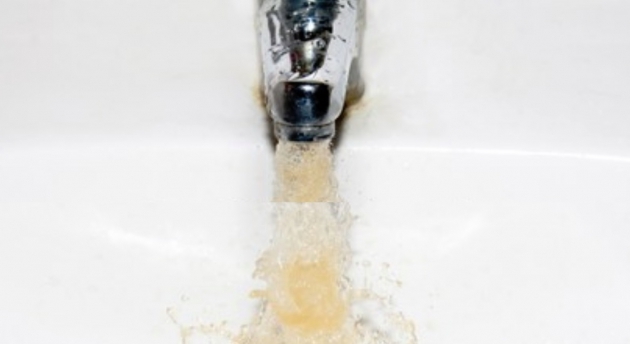 You can eliminate some potential causes of brown water by running your cold water taps for approximately 20 minutes. Municipal water companies will often use hydrant flushing to clear any sediment in the pipe network to restore the quality and clarity of the water supplies. Unfortunately, this can allow this sediment into the water supplies, but if your water runs clear after allowing the taps to flow, the problem should have been resolved. If, not you’ll need to investigate further. Unless you have conducted a water quality test, you should not drink brown, discolored water. While rusty water may be okay to drink, if you can stomach the metallic taste, there could be other contaminants lingering in your water, not just rusty particles. Brown water can be caused by contamination from chemicals, organic materials, organisms or dangerous viruses, so it is best to err on the side of caution avoid using it until the underlying issue has been resolved. You may also notice that your water appears cloudy and there are a number of reasons for this. Cloudiness can be caused during the pumping process when tiny air bubbles are introduced. These typically clear within a few seconds, but if they don’t clear, it could be due to a high mineral concentration that has been brought out of the water due to high-pressure pumping. If the cloudiness is localized to your hot water, it could be a result of the heating process. As water comes to the boil, the oxygen and carbon particles are separated creating steam. Since your hot water is stuck in your pipes and your hot water heater, this can allow the separated molecules to concentrate inside the water, which makes it cloudy. As the heated water cools, the cloudiness settles either by being released as steam, or it will be condensed back into water. If you find that your water is discolored or brown, try running your cold water tap for approximately 20 minutes. If the water continues to flow discolored, call your local municipal water company to report a problem. If the water is only brown from your hot water tap, you may need to flush your water heater or have your water pipes checked to ensure there isn’t a rust problem. If you have ongoing water quality issues, it is a good idea to consult a professional water treatment specialist. A fully WQA certified technician can not only perform water testing, but also guide you through the appropriate treatment options.